Origin: Probably southern European, for the Ottoman market. 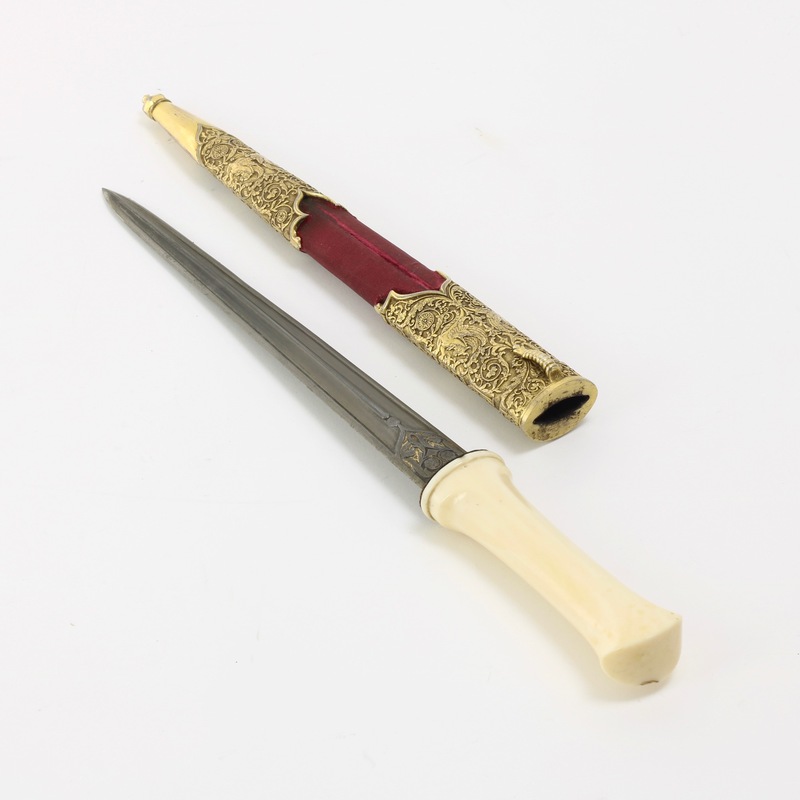 A very nice and unusual dagger of a type called hancer (خنجر‎) or hançar ( خنچار‎ ) in Ottoman Turkish. 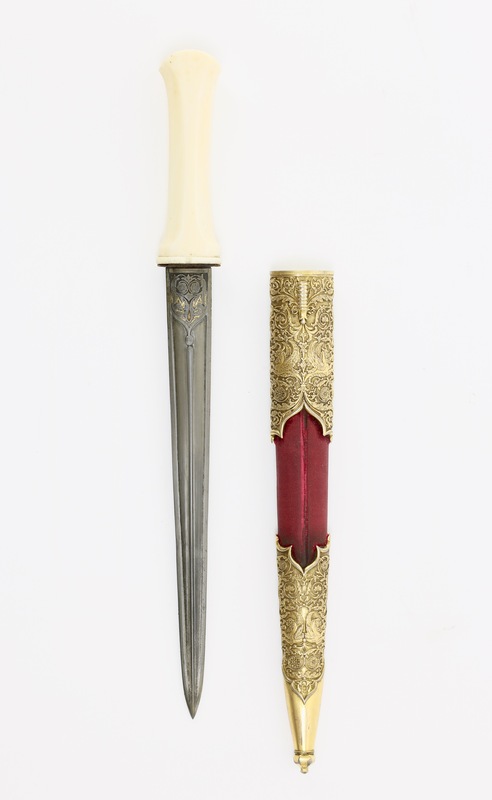 This particular style, with somewhat hourglass-shaped handle and narrow, double edged blade is often called "Ottoman court dagger" in English because most are well-made and associated with the Ottoman elite. The most striking feature about this piece are the heavy white metal mounts, elaborately elaborately decorated with griffins and scrolling vines with rosettes and acanthus leafs. 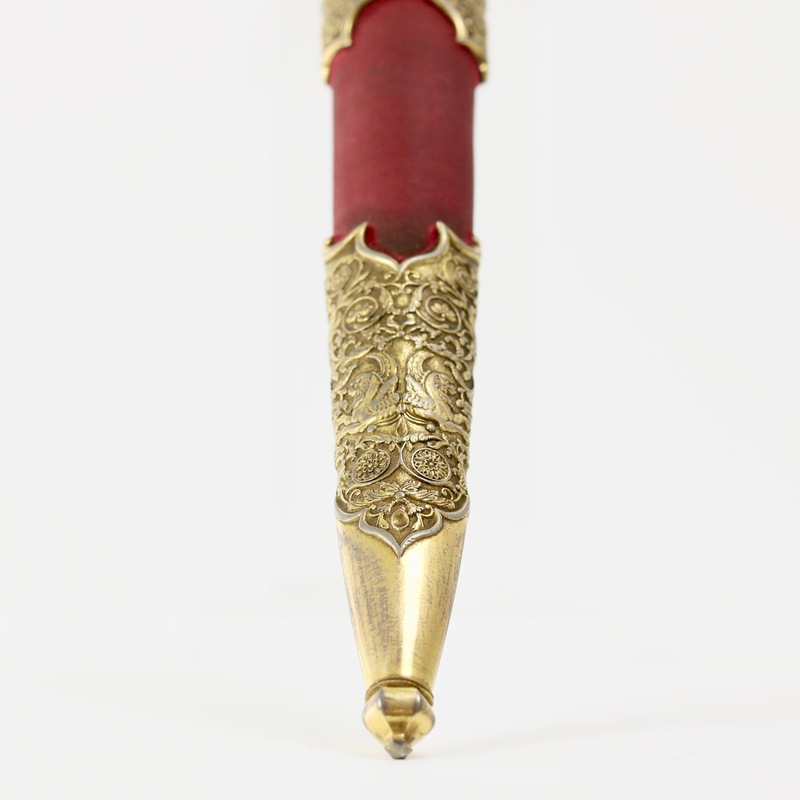 The designs are very finely detailed, and stand out in relief. 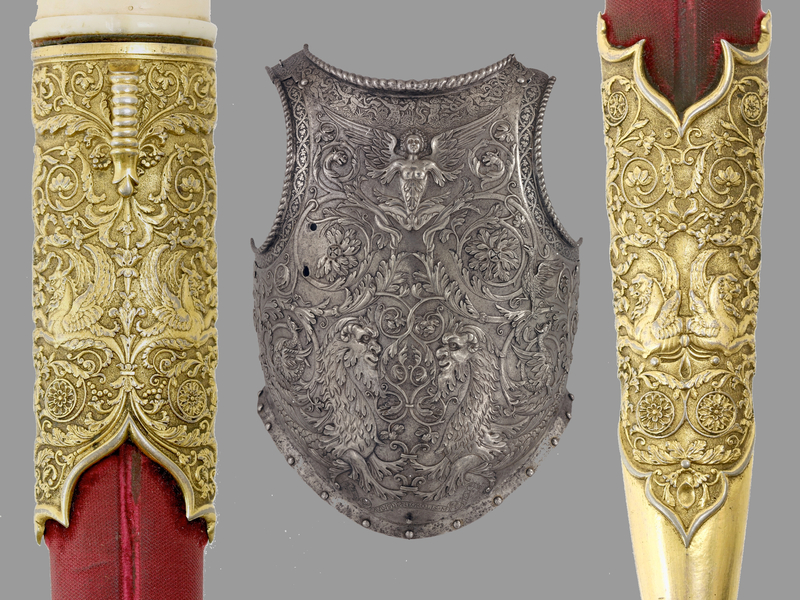 The mounts are fire gilt, with some wear on the high spots due to age. 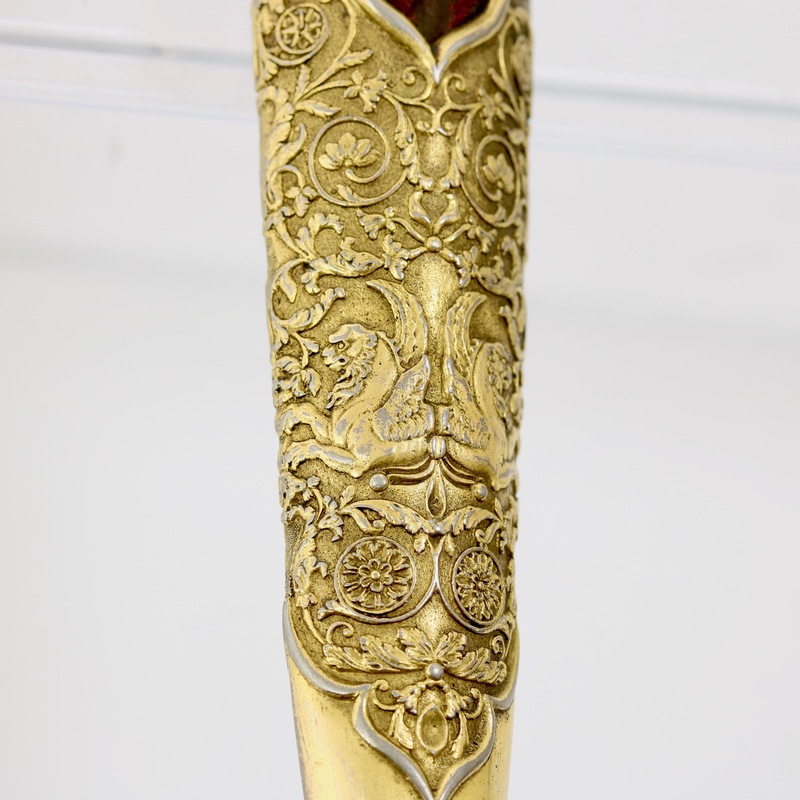 Despite the wear of some gold, the designs retained all their fine detailing. 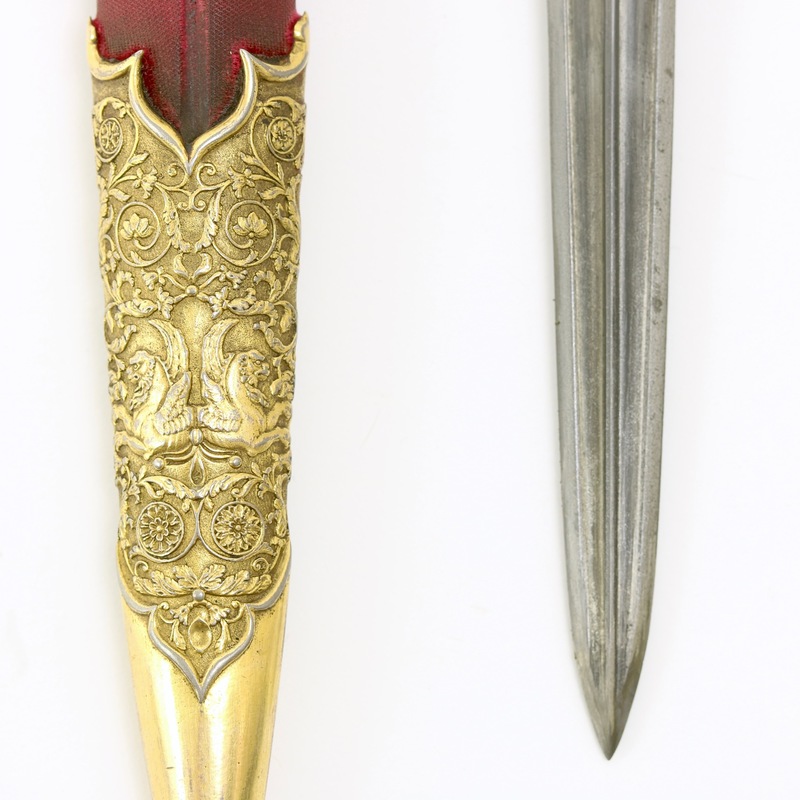 The dagger left and right compared with a 16th century Milanese breastplate in the Metropolitan Museum. It's hard to draw any sound conclusions on place of manufacture, but from the above comparison we can at least be sure that whoever made it was very well acquainted with Italian renaissance work. 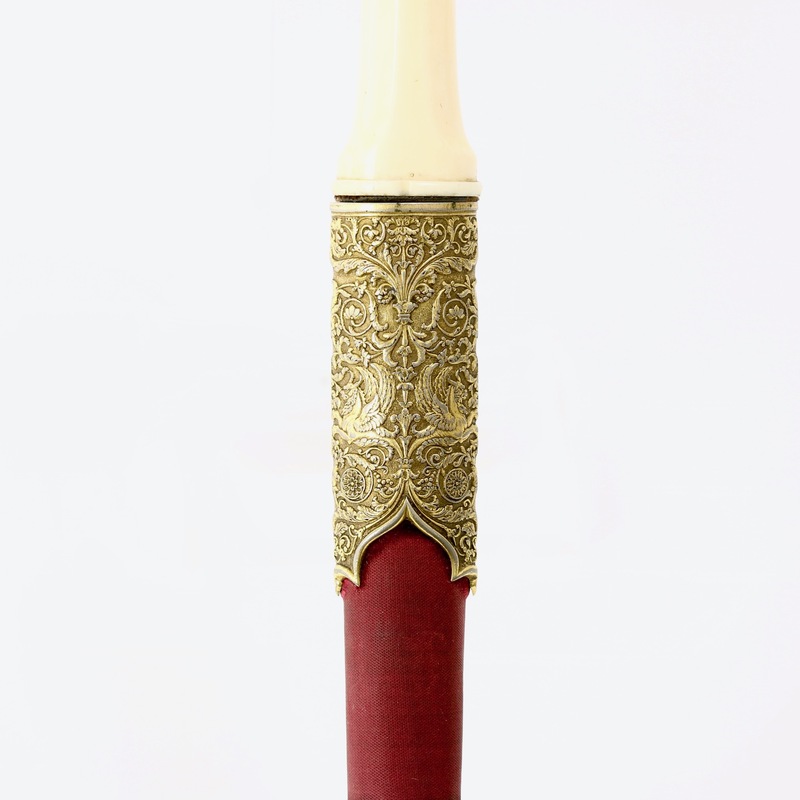 We do know that in the 19th century, Europeans made work for the high-end Ottoman market, most notably Manceaux of Paris. I have one of these for sale at the moment. Such European made pieces tend to be signed and stamped with maker’s marks and silver / gold proof marks. 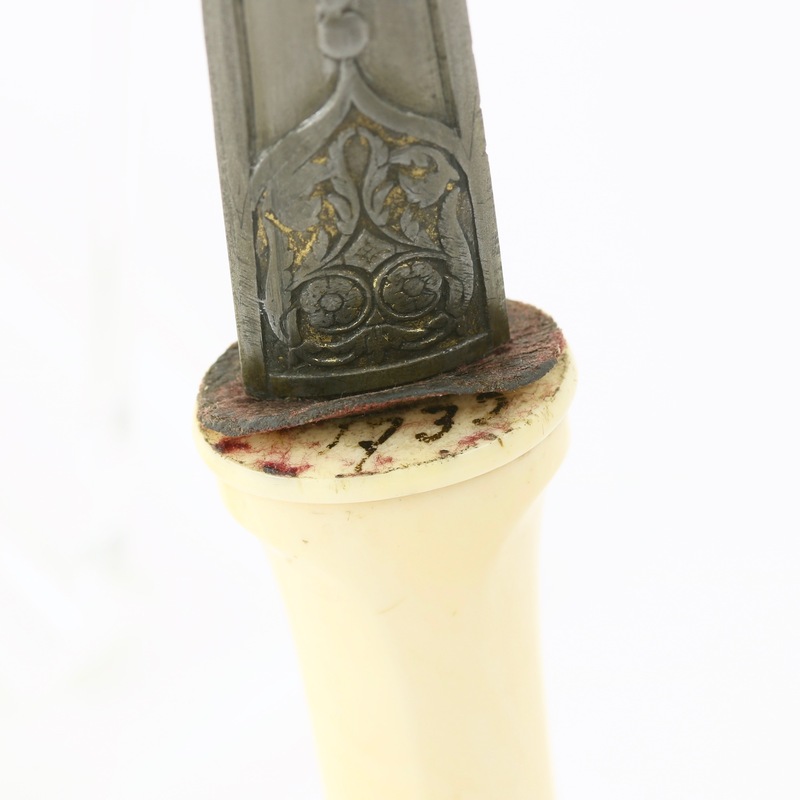 This piece comes with no markings whatsoever, save for a number under the fabric washer that protects the ivory handle from the mouthpiece: 1732. A date? I personally am inclined to think the piece is probably a little bit later, late 18th to early 19th century, but the use of European style script does suggest manufacture in Europe. 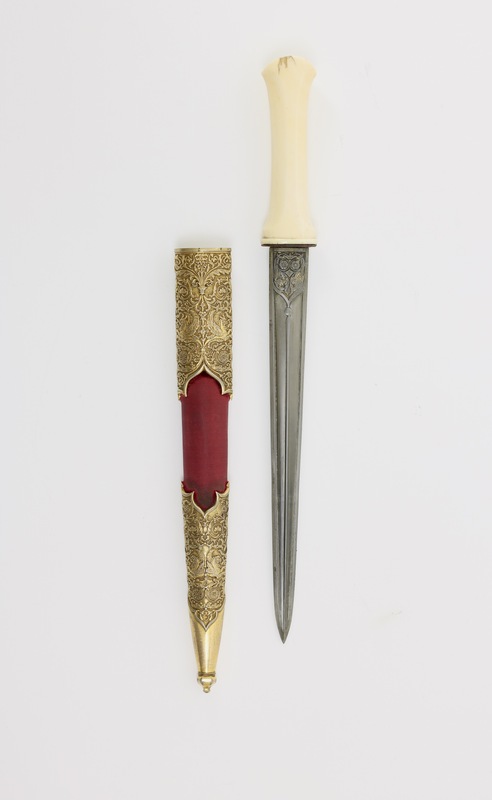 The dagger has a nice sleek ivory hilt, with a sharply pointed dagger blade, both in pure Ottoman style. 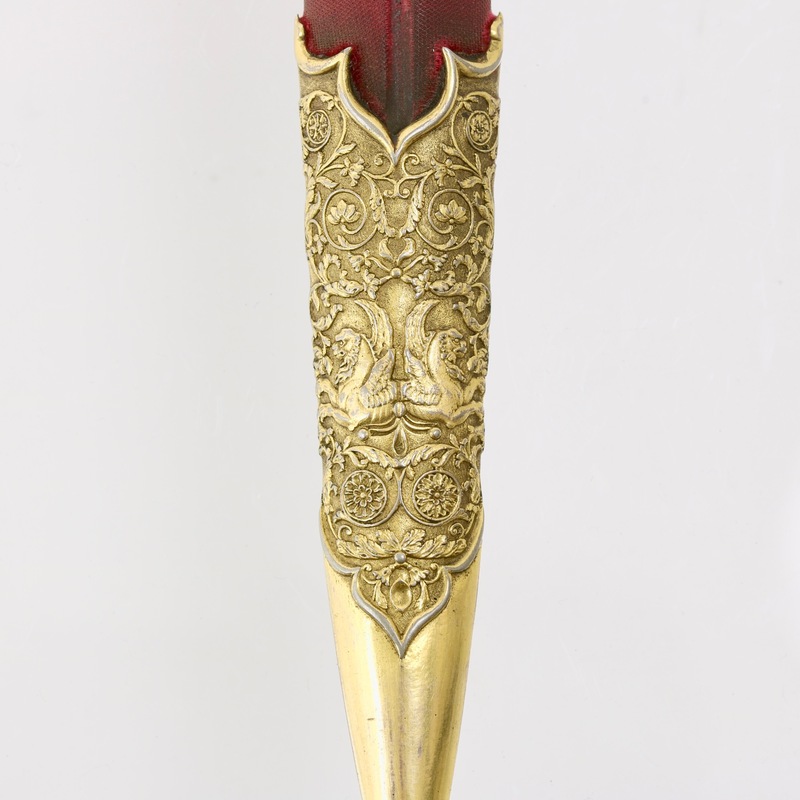 The base of the blade is chiseled with acanthus leafs and two rosettes on either side with remains of gilding. The blade itself has a sunken panel and raised center rib. The steel seems to be an incredibly fine crucible steel, like wootz, but with its pattern hardly visible. 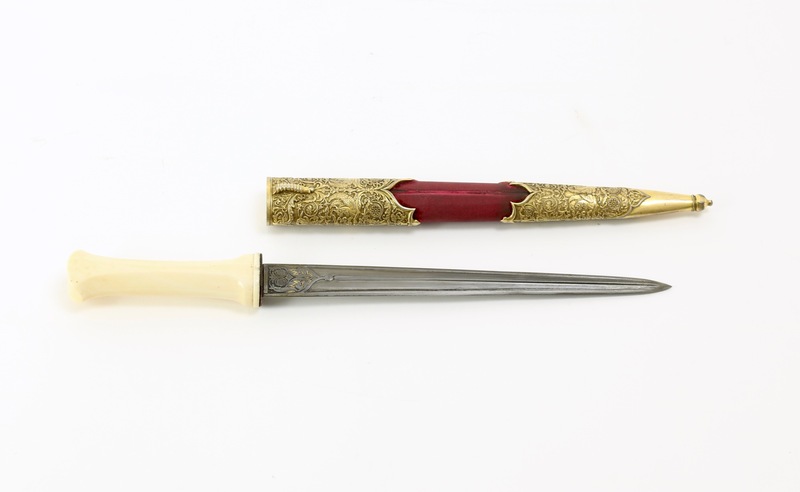 Several Ottoman court daggers have turned up with very similar steel blades. 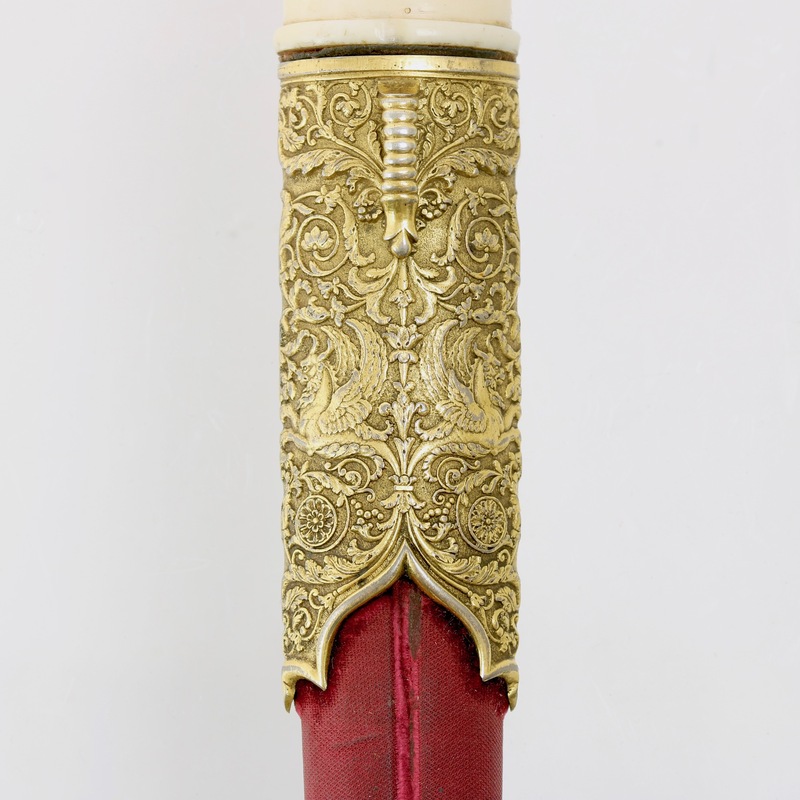 The scabbard body is covered with deep red silk velvet, showing mostly the warp as much of the pile is now worn. Overall in good condition. 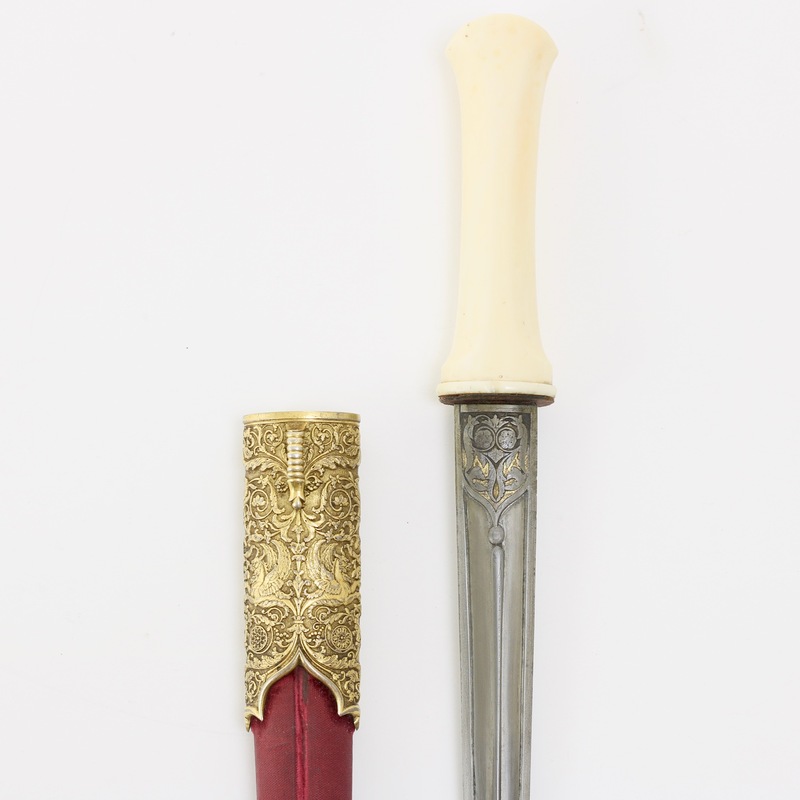 Some minor wear on the decor on the forte of the blade, some losses of gold, and some chips off the ivory handle. See pictures. 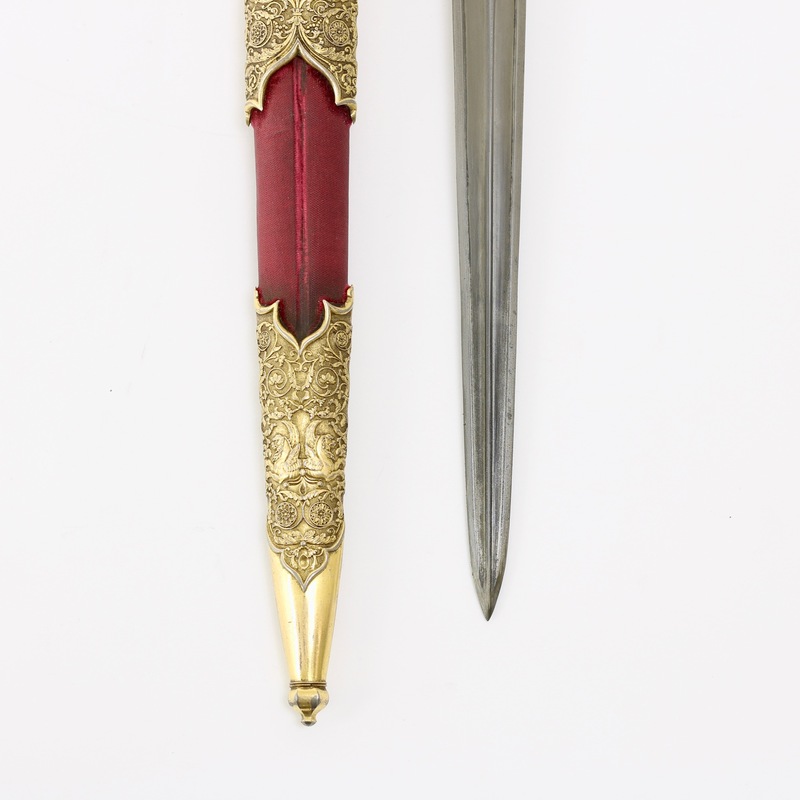 A very unusual Ottoman court style dagger, possibly made outside of the Ottoman empire but clearly for the Ottoman market. 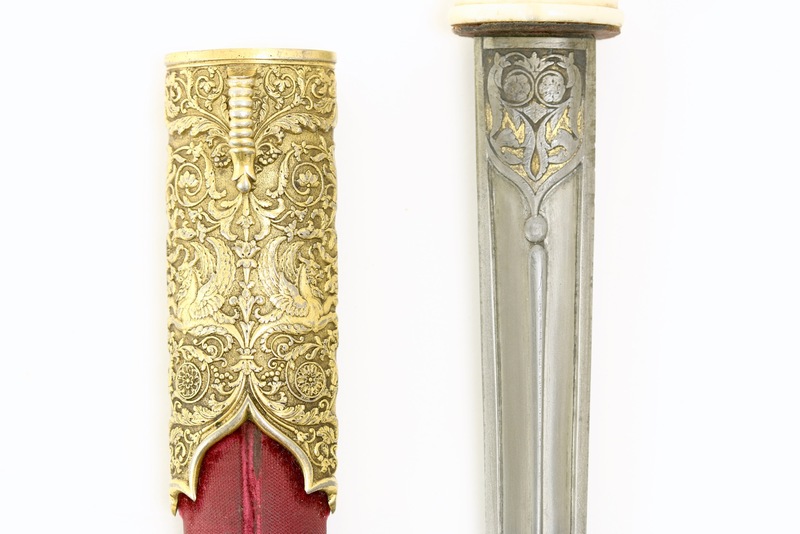 The mounts are incredibly fine, with renaissance revival designs and as such is the only dagger of it's type I've ever seen. It is quite possibly unique. 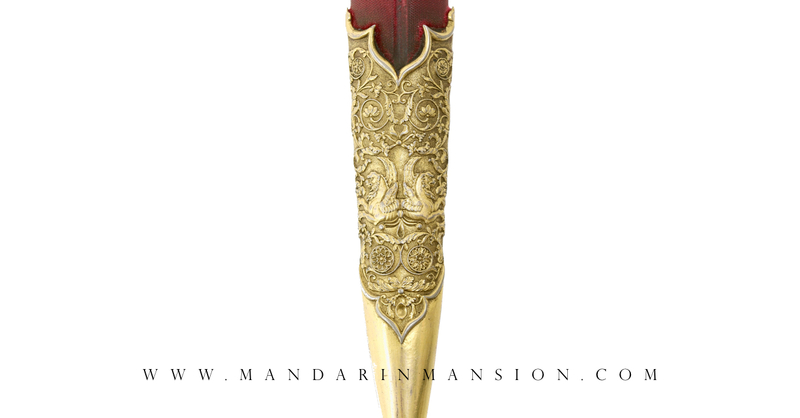 It is a wonderful product of cross-cultural influences, representing the refined and cultivated tastes of those wealthy enough to afford such sumptuous pieces.